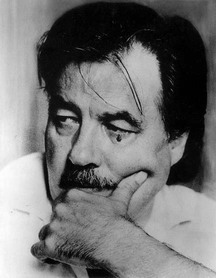 George Ryga (July 27, 1932 - November 18, 1987) was a Canadian playwright and novelist with a broad international reputation. George was born in Deep Creek, near Athabasca, Alberta to poor Ukrainian immigrant parents. Unable to continue his schooling past the sixth grade, he worked at a variety of jobs, including radio copywriter. George continued to study, taking correspondence courses, and winning a scholarship to the Banff School of Fine Arts. In 1955, he traveled to Europe, where he attended the World Assembly for Peace in Helsinki and worked for the BBC. The following year he returned to Canada. While living in Edmonton, he published his first book, Song of My Hands (1956), a collection of poems. Ryga's first play, Indian, was performed on television in 1961. He achieved national exposure with The Ecstasy of Rita Joe in 1967. The work, considered by many to be the most important English-language play by a Canadian playwright, is the story of a young native woman arriving in the city who finds that she has no place with either her own people or the white man. It was performed in Vancouver, at the National Arts Centre in Ottawa, and in Washington State. In 1971, the work was performed as a ballet by the Royal Winnipeg Ballet. He died in Summerland, British Columbia in 1987. His home was turned into the George Ryga Centre, an arts and cultural centre (closed 2012). For publishing rights, please contact Talon Books Ltd. via the link in the top navigation menu. For inquiries regarding film options or performance rights, for amateur or professional stage productions, please contact Tanya Ryga .